It is time for another Challenge with Scrapbook Essential BC, it is our 8th challenge. 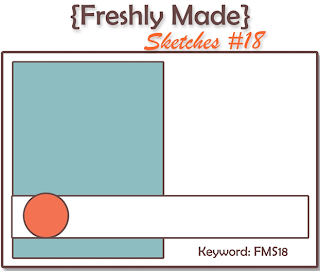 This week we are doing a Clean and Simple Sketch. I heat embossed the butterfly and sentiment in brown, and finished with some twine and pearls. Please stop by the Scrapbook Essential BC online store to see the fabulous items, the following supplies used on this card are available - Bo Bunny designer paper and stamps. Supplies: Cream and brown cardstock, Designer Paper - Bo Bunny, Essential Stamps-Whimsical Bird and Butterflies, Spellbinders Nestabilites, Fancy Floss, Recollections pearls. Merry Monday everyone :). 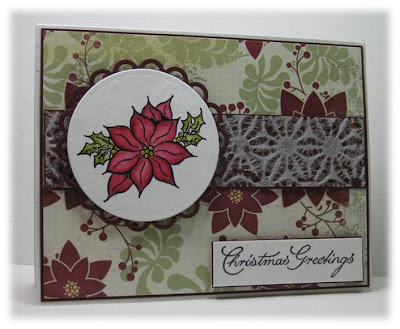 Lesley selected my card from last weeks Merry Monday Challenge as a winner. I am so excited that next week I get to be a guest designer. For this week I wanted to do a little colouring with my Tombow's I really don't use them enough. I also found this beautiful lace like mulberry paper, I am not all that sure it matches the card but I don't care :) I was determined to use it. Supplies: Natural While and Burgundy cardstock, Designer Paper - My Mind's Eye, Frogs Whiskers Ink-Poinsettia, Cornish Heritage Farms-Christmas Greetings. It has been a long time since I have played along with the Clean & Simple stamping challenge. The challenge does shows paper piercing, but I know I can not manage a whole frame of piercings. 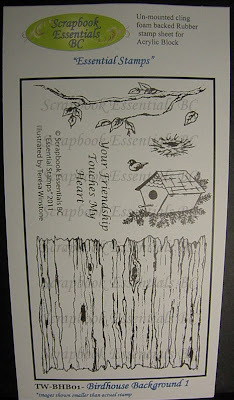 I received my new The Stamps of Life set and wanted to ink it up, I love the flowers that Stephanie creates. Simple enough - I stamped the flowers and heat embossed them with brown, same with the sentiment, both are popped up with foam tape. I also inked all the edges. 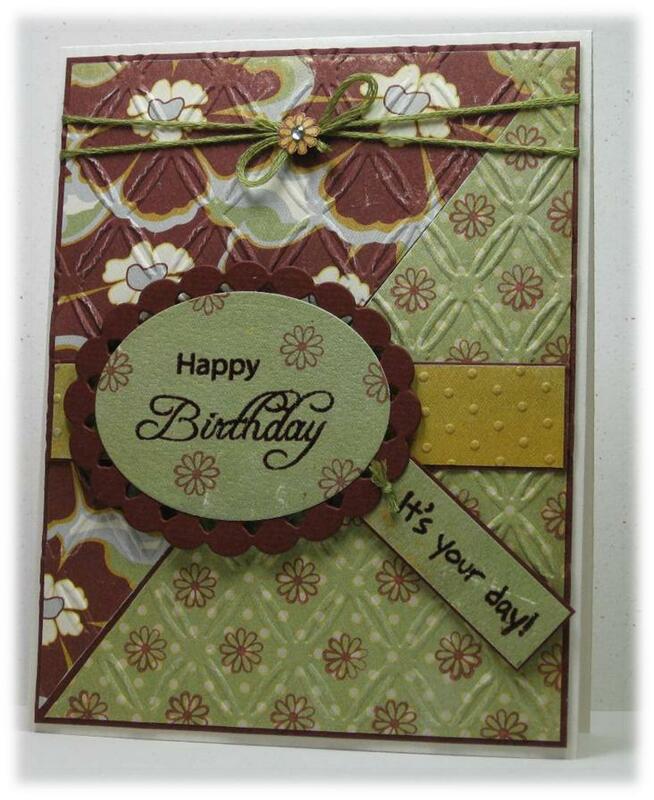 Supplies: Cream and brown cardstock, Designer Paper-Authentique, The Stamps of Life-list2write, misc ribbon, Recollections-pearls. Good Morning All - a quick post this morning before I run out the door to spin class. This morning’s card is for the current The Friday Mashup challenge. Happy Friday – It is time for another Challenge over at Playing in Paradise and it is my turn to host. I layered black and red glitter paper, used my SCAL software and Cricut for the cutout and heart. I used Fancy Floss to suspend the heart. 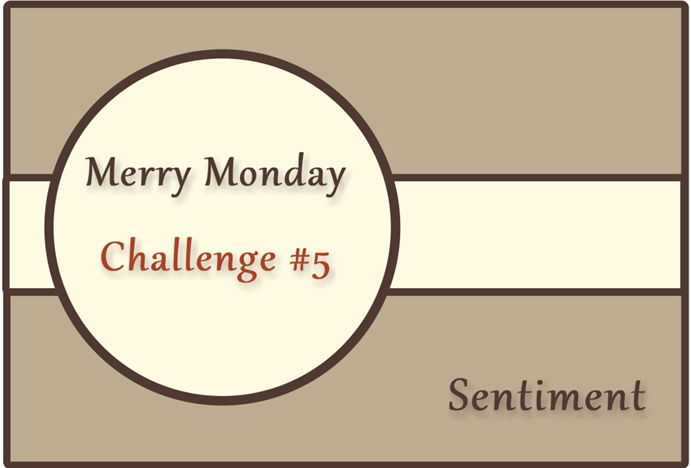 Please take a few minutes to visit the challenge blog to see what the other team member have created. 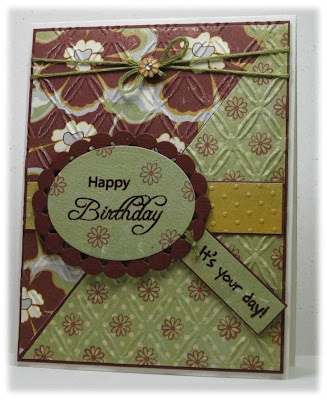 Supplies: Cream cardstock, Designer Paper- Best Creations Inc, Hot off the Press- Tiny Words and Phrases, Sew Easy-Fancy Floss. A quick post this morning for the current Mojo Monday Challenge. Supplies: Natural White cardstock, Designer Paper-Jillibean Soup, Paper Inspirations- Birthday Joy Calligraphy, misc ribbon and pearls. 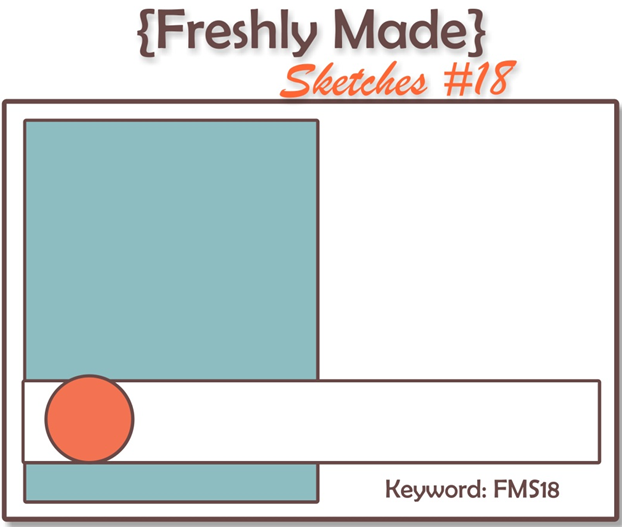 Another week has zoomed on by and it is time for a new challenge at Freshly Made Sketches. 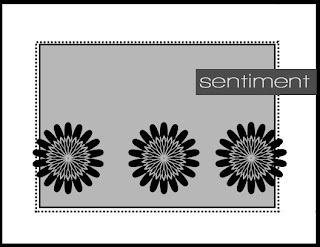 I went with a simple square card, I have been wanting to use this stamp for a long time so I inked it up with brown ink, then added small dots with yellow glitter pen where the pods meet the stalk. 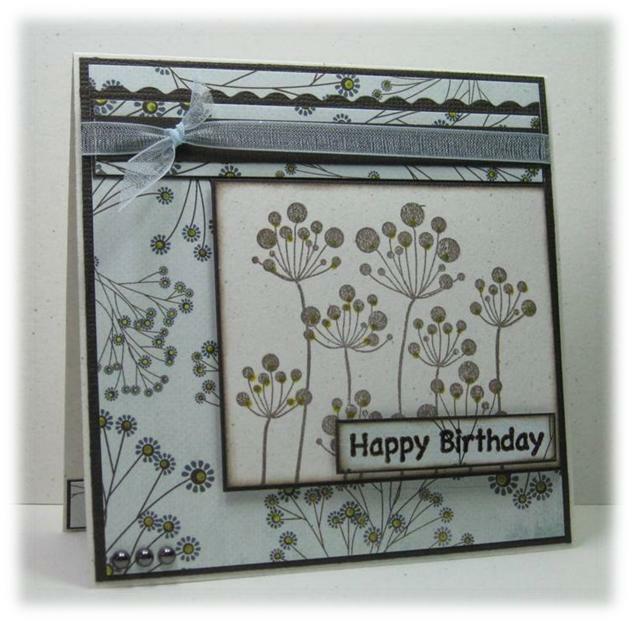 I did the same to the flower centres on the designer paper. I finished with adding double bands of ribbon and pearls. Supplies: Natural white and brown cardstock, Design Paper-Basic Grey, Studio G-Botanical Background, Hot of the Press- Tiny Words, misc ribbons, Recollections pearls. 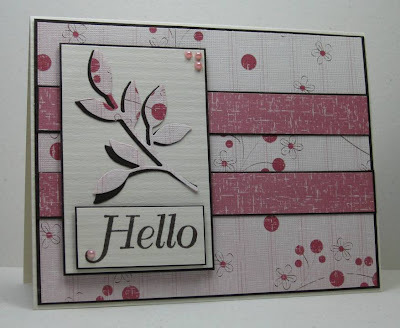 It has been a wonderful month of challenges for me as a Guest Designer, it has been amazing to share the creative spotlight with all these very talented cardmakers. Thank for having me ladies, see you on the other side of the Linky tool :). I had a fabulous post all prepped and loaded for a scheduled post this morning.. and blogger just ate it, lost and gone. So I am so sorry that this post is a little late. 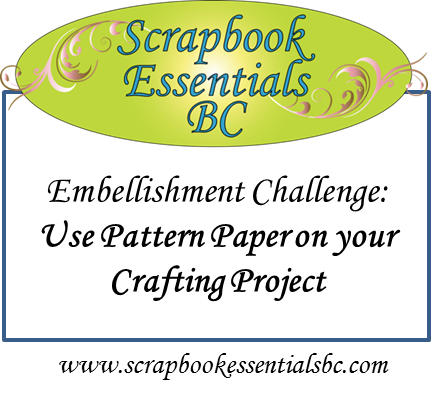 It is time for another Challenge with Scrapbook Essential BC, this is our 7th challenge and this week we are asking you to create a card using patterned paper. 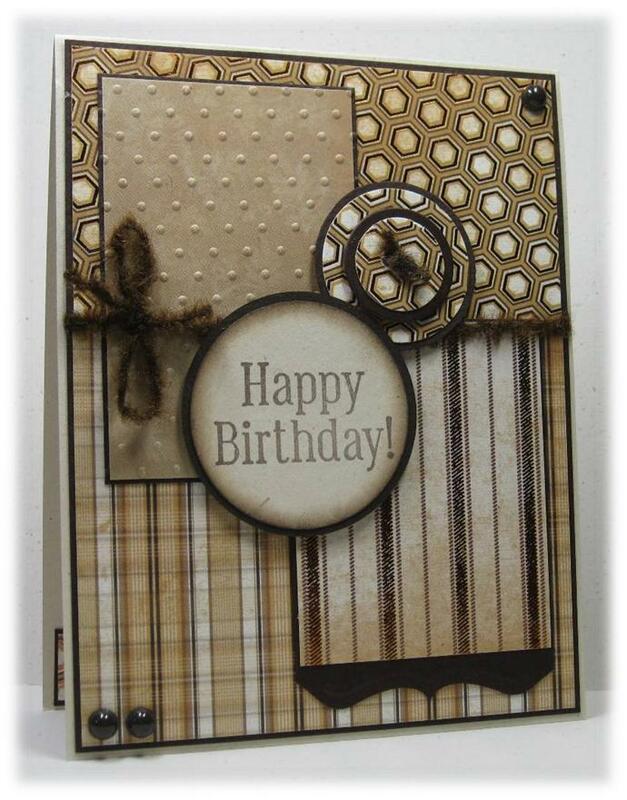 I tried for a clean card to showcase the designer paper, but did add some texture. 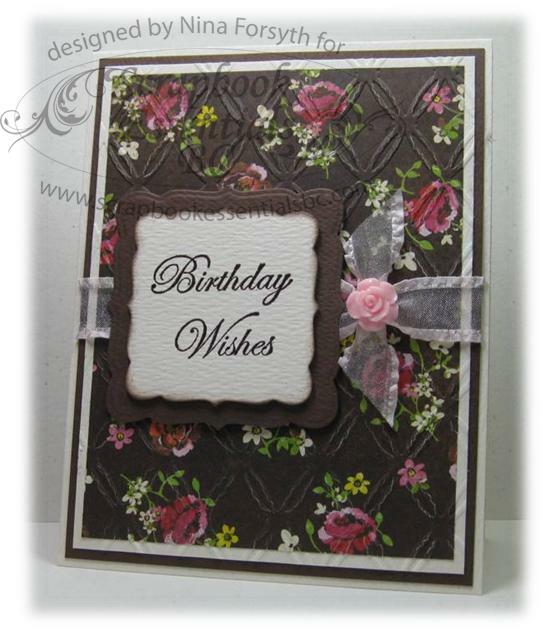 My sentiment is heat embossed in brown then I finished with some frilly ribbon and a resin rose. 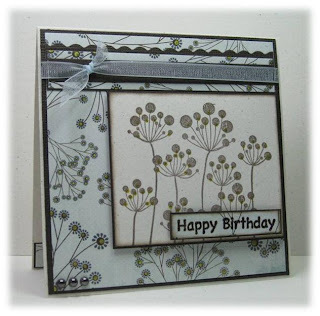 Please stop by the Scrapbook Essential BC online store to see the fabulous supplies Stacey has, the following supplies used on this card are available - Basic Grey designer paper, embossing folder, frilly ribbon and resin roses and so much more. 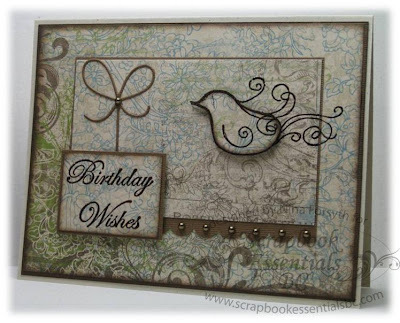 Supplies: Cream and brown cardstock, Designer Paper - Basic Grey, Essential Stamps-Whimsical Bird, Spellbinders die cuts, Couture Creations- Embossing folder, frilly ribbon and resin roses. A quick second post for today's current Merry Monday challenge, this is the fourth fabulous sketch from Lesley. I dug into my scraps for this card. ﻿I added to texture to both layers then cut out the four layers of the snowflake with Spellbinders die cuts. 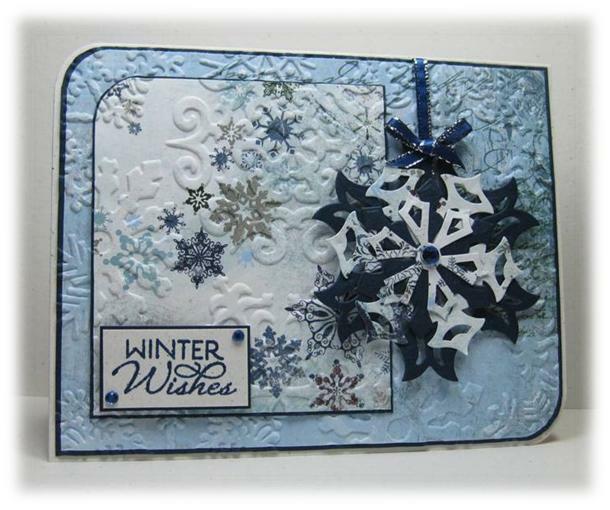 The sentiment is heat embossed in Navy then I finished the card with some silver edged ribbon and gems. 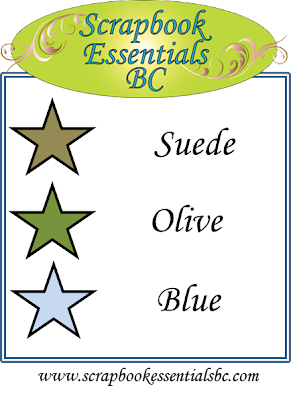 Supplies: Natural white and blue cardstock, Designer Paper-Bo Bunny, Verve-Glad Tidings, Spellbinders Die cuts, Cuttlebug folder, Hero Arts gems, misc ribbon. 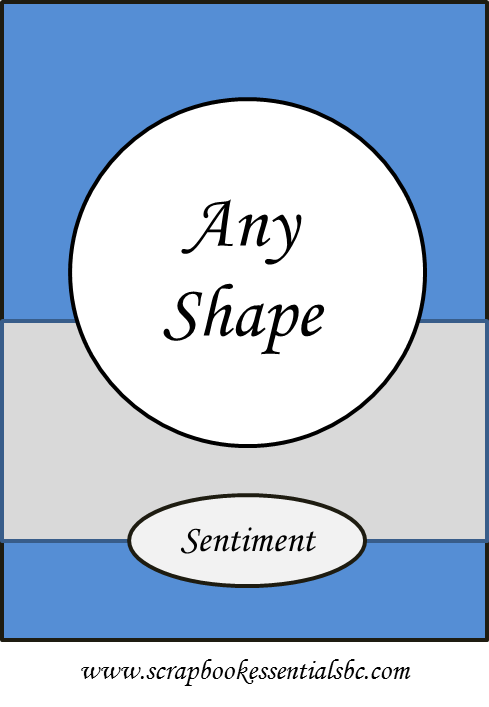 My mojo seems to be lagging a little today, when that happens I will tend to slide back into a comfort zone.. masculine cards. I recently brought some fabulous new stamps that I could not wait to ink up so today was the day. 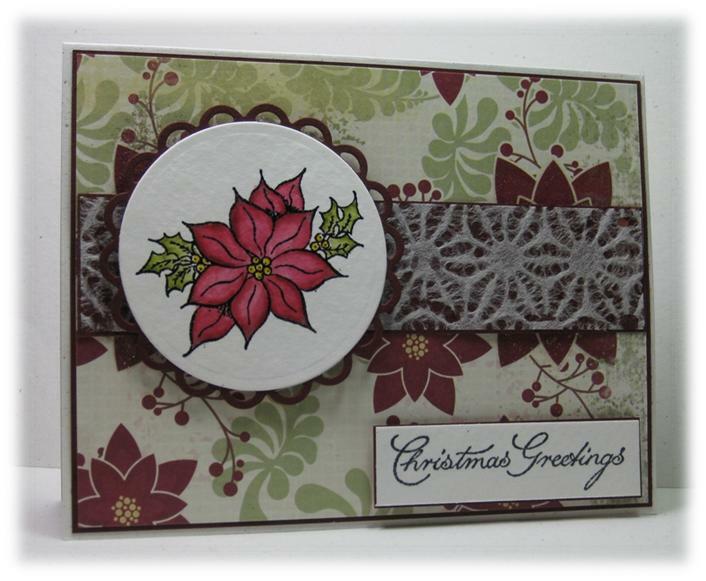 I used some scraps for the background and added some texture with an embossing folder. I stamped the image with brown Stazon then coloured it with my watercolour pencils. I added a little brown edging and some Clear Star glitter pen. Supplies: Natural Ivory, green and brown cardstock, Designer Paper- Unknown, Flourishes-What a Catch, Taglines, Spellbinders, Embossing folders, misc twine and gems. See you back here tomorrow for a new Merry Monday!! 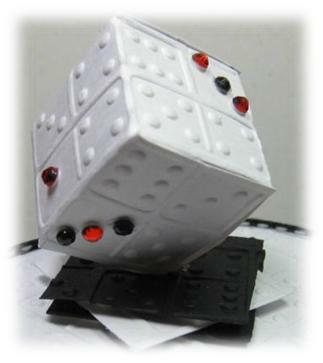 Make a project using "Paper Piercing". 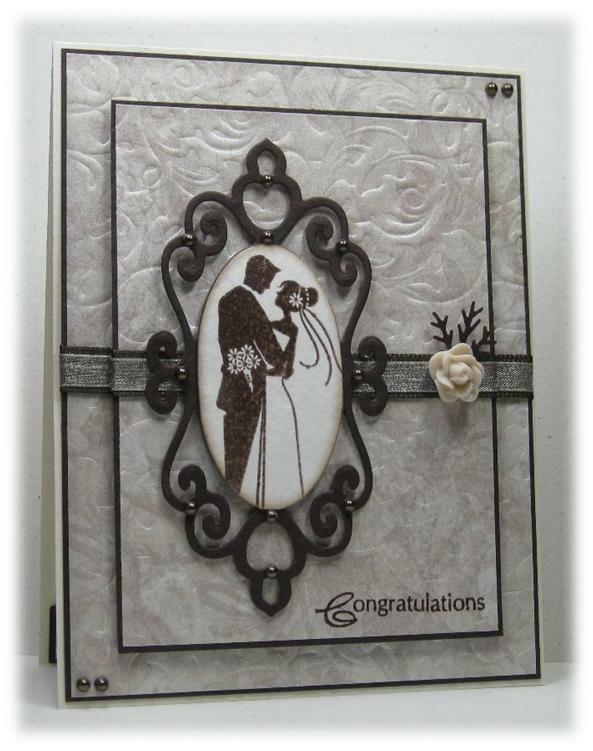 Or Make a project using the colors "Blushing Bride, Riding Hood Red & Early Espresso". Or "Mash it Up" and create a project with the "Color Combo & Paper Piercing". I am hoping that I managed to get close to the colours for this challenge, I picked up this pretty paper in one of the local craft stores and could not wait to use it. 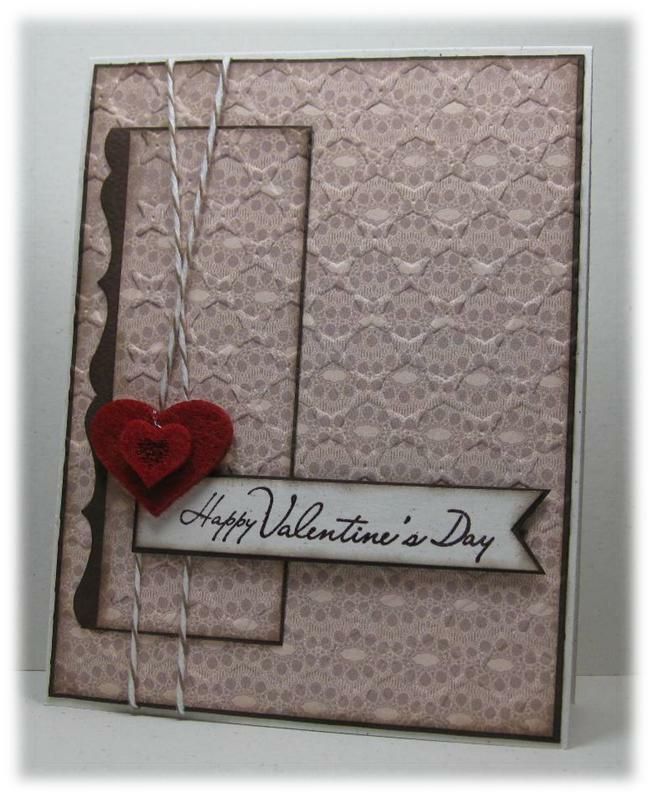 I love the soft pink and gray, I layered with brown cardstock and added texture. I stamped and embossed the sentiment in brown, and put a light brown edge for all layers. I finished with a felt heart from my stash and some twine. 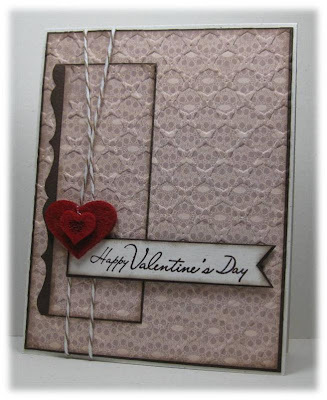 Supplies: Natural White and brown cardstock, Designer Paper-Authentique, Inkadinako-Happy Valentine’s Day, misc twine and felt heart. Hello Friday.. it is so nice to see you :). 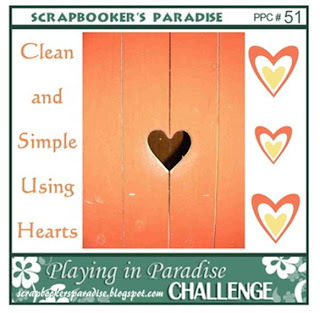 Friday's also mean another Playing in Paradise challenge over at Scrapbooker's Paradise﻿. This weeks inspiration photo can mean many different things, because it is what you see in the picture that inspires YOU. For me, I saw multiples, multiple penguins, multiple colours and so on. I brought a new Cricut Cartridge and Martha Stewart punch that I have itching to use so I made this card about lots and lots of butterflies. I stepped way out of my comfort zone with this one. 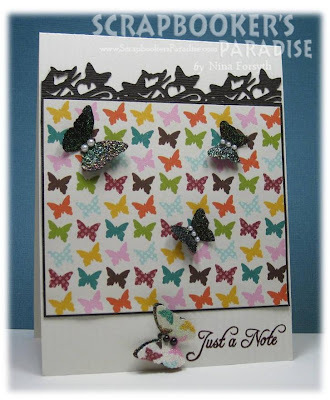 I worked around this bright and busy DP, then added the butterfly border on top. I used a both my Cricut and punch for the stand alone butterflies that I had heat embossed with holographic embossing powder. Supplies: Cream and brown cardstock, Designer Paper-Echo Park, Inspired by Stamping-All year Wishes 1, Cricut-Ribbons and Rosettes, Martha Stewart punch, Recollections pearls. 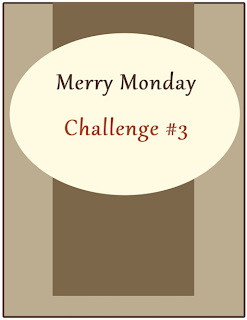 Good morning all, a quick post this morning for the current Mojo Monday Challenge. 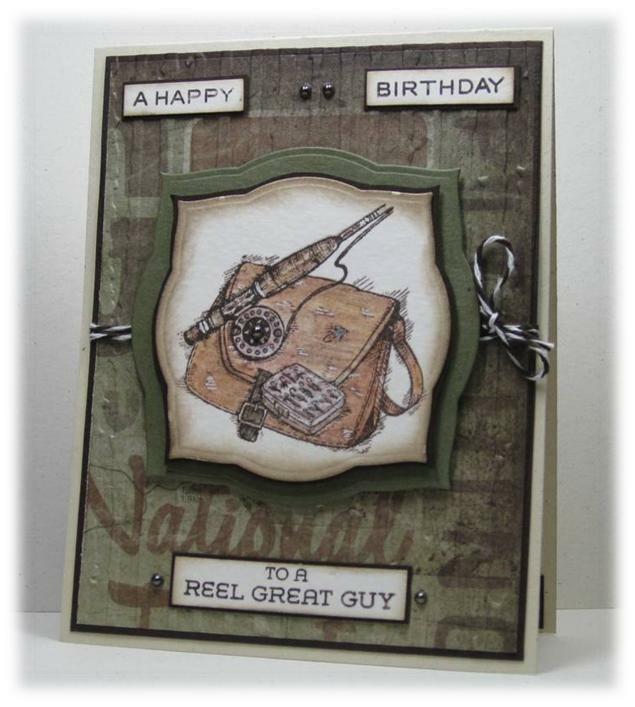 Lots of layers and texture for this card, then I cut-out some of the poppies from the DP to pop up around the sentiment. I finished with a couple of small branches. 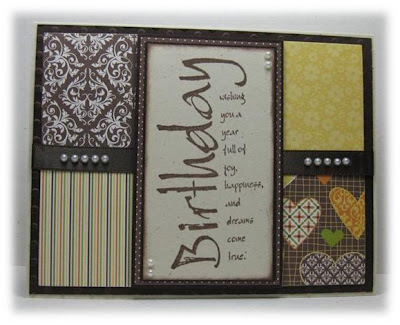 Supplies: Cream and brown cardstock, Designer Paper-Authentique, Inspired by Stamping-All Year Wishes II, Spellbinders die cuts, Martha Stewart punch, Cuttlebug folders. Victoria is experiencing a little blast of winter, we are lucky if we get a week of snow a year and I think this is the week. I am not looking forward to my drive to work this morning, when I walked home from bootcamp last night the sidewalks were super icy. 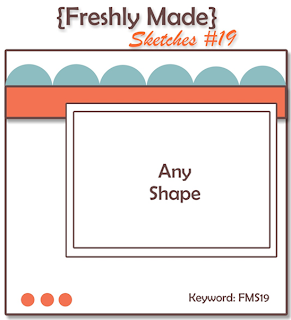 Today's card is for the new Freshly Made Sketches Challenge. I thought this designer paper had so many pretty flowers on it that I wanted to use them all, so I used the pattern on the panel instead of a stamped image.. cheating.. maybe a little :). It is not really visable in the picture but I added bits of glitter pen to each of the flower centers. 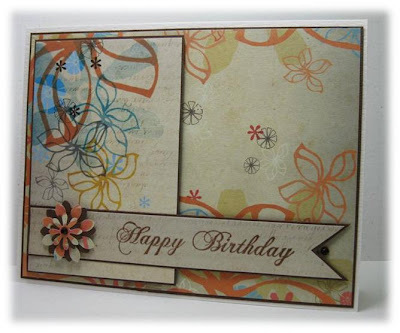 Please stop on by the Freshly Made Sketches blog to see all the fabulous cards made by the design team. Supplies: Cream and brown cardstock, Designer Paper-7 Gypsies, TPC-Cardmaking Happy Birthday, misc flower punches. ﻿This week’s challenge for Scrapbook Essentials BC is a colour challenge. 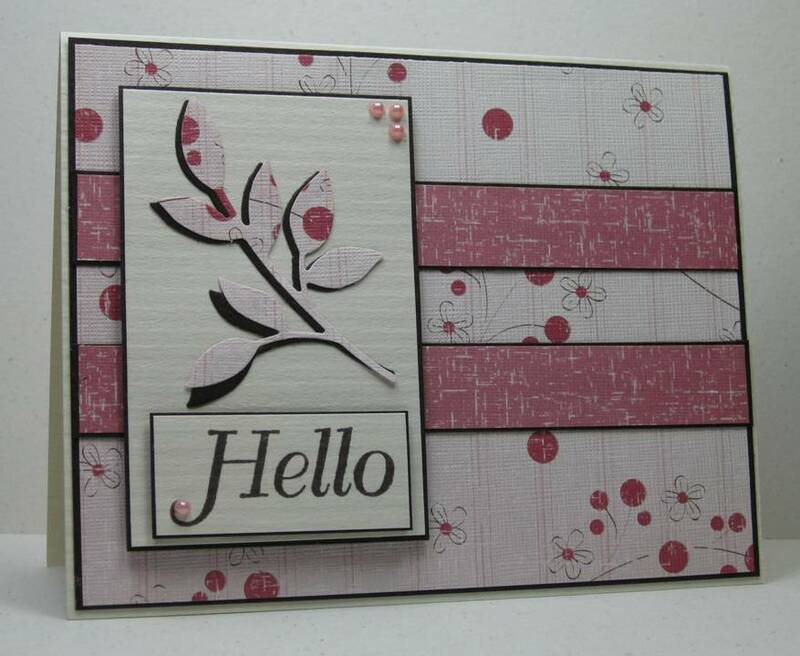 Isn't this stamp set beautiful, I paired with Bo Bunny-Welcome home for my card. Both of these products can be found in the online Scrapbook Essential BC store. I stamped this bird twice and heat embossed one in brown then cut it out and popped it up to make it 2D, the sentiment is also popped up. I finished with a small paper bow and pearls. Please visit the Scrapbook Essentials Challenge blog to take a look at the fabulous cards that the Design Team have created for this challenge. Supplies: Natural Ivory and brown cardstock, Designer Paper- Bo Bunny, Scrapbook Essential BC-Whimsical Bird, Memory box die cuts, Recollections pearls. 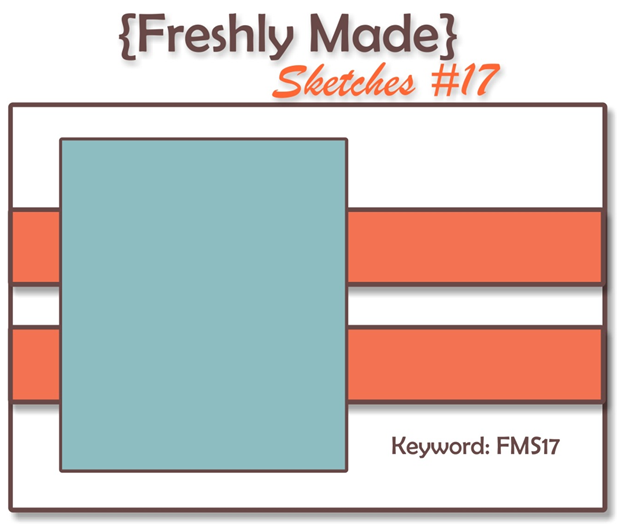 I love the layout of these sketches, it allows for simple clean cards . 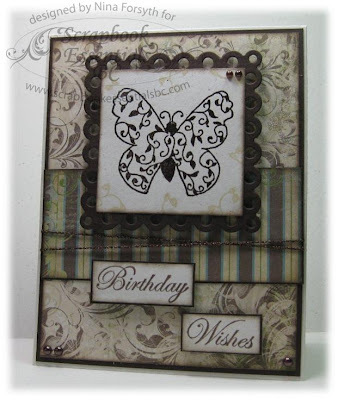 I offset rounded corners and used a Spellbinders for the sentiment frame, I finished with tiny gems. Supplies: Natural white and red cardstock, Designer Paper-Upsy Daisy Designs, Spellbinders dies cuts, Verve-Bright Spirits, misc gems. You don't expect to see those words strung together now do you. I have quick post to show you, a fabulous project I work on Saturday. 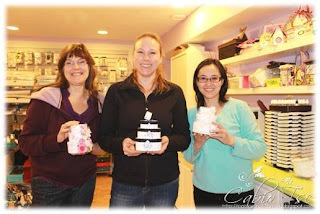 A small group of us got together to do a little crafting, Cabio had an idea she wanted us to try. These started out as stacking boxes by Melissa Frances. Can you tell which one is mine.. I am soo not a girly girl. 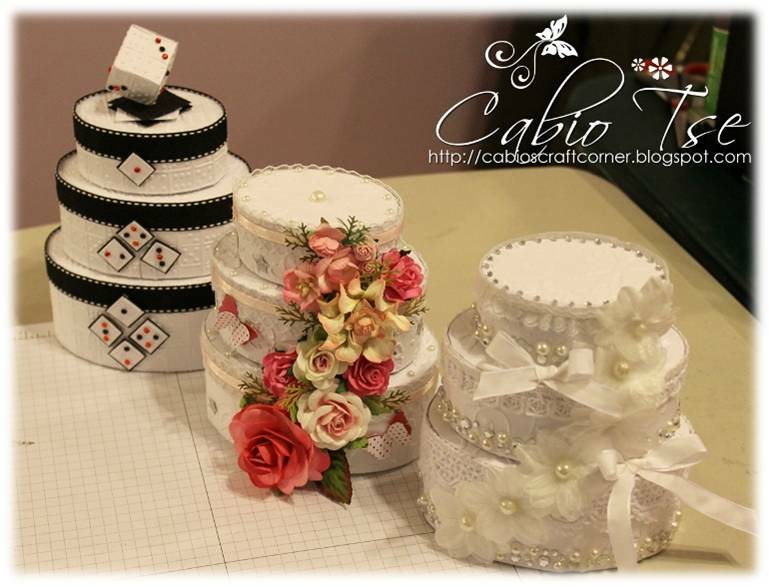 The other ladies made stunning elegant and so so beautiful projects, these are three of finished items. One of the ladies was still busy adding bling. Three of us ladies holding our projects. Like the background, that is Cabio's craft room not a store.. it is amazing and I am in awe each time I see it. The top box is glued shut but the bottom two boxes can open up to put some trinkets or treats inside. I was pretty impressed with myself for accomplishing this. Thank you Cabio for taking these great pictures. I have a few more on my camera that I will add a little later.. I am charging my camera battery. I think Cabio has more pictures on her blog, pop on over to take a look, she has made several of these amazing project. Supplies: Stacking boxes-Melissa Frances, white cardstock, Cuttlebug folder, misc ribbon and gems. It looks like a chilly morning out beyond the windows, we had a light dusting of snow last night our first for the winter. 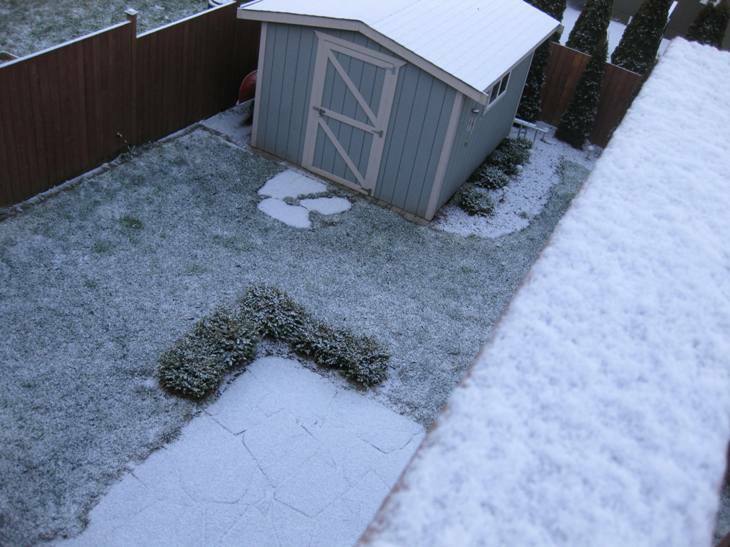 We have sun and flurries predicted for today too I don't imagine it will last long though. Friends of ours are rumoured to have been married this weekend. It was all hush hush and a small private ceremony. This card is for when it is confirmed said rumoured ceremony actually took place. :) I like to be prepared after all. I embossed this beautiful shimmery paper with an Spellbinders Impressabilites and popped each layer with foam tape. I heat embossed the image then cut it out and added edging before gluing to the Spellbinders Shapeabilites. I double layered the ribbons, they finished the card by added the rose, branch and pearls. 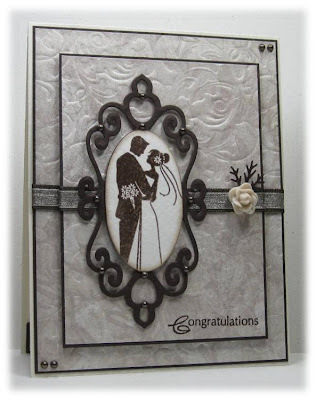 Supplies: Cream and brown cardstock, Designer Paper- Imaginisce, Spellbinder Nestabilites, Shapeabilites and Impressabilites, Inkadinkado-Congratulations, Recollections-Rose, Kaisercraft pearls, Martha Stewart punch﻿, misc ribbons. Good Evening all, I had some time to get another quick card in today. This one for the current The Friday Mashup challenge. 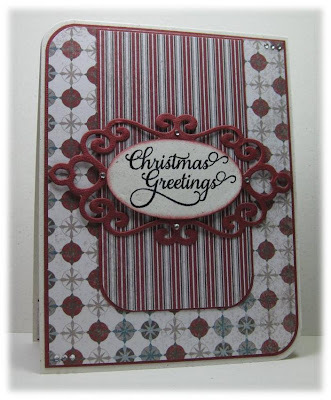 I heat embossed the sentiment and then popped each layer up with foam tape and finished with some ribbon and gems. Supplies: Natural While and green Cardstock, Designer paper-K&Company, Close to my Heart-Gracious Greetings, Spelbinders Nestabilites, Kaiser Graft Gems. It was a super busy work week for me, I am so happy that I finally got a chance to sit down to do a little crafting last night. 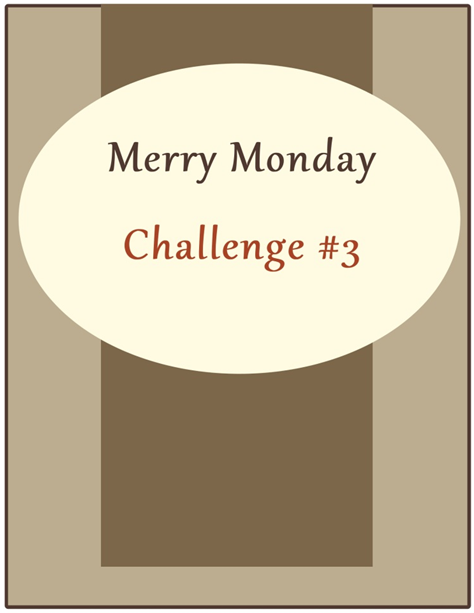 This weeks Mojo Monday challenge was a little daunting for me so I kept putting it off and putting off in hopes I would have an idea that clicked. I ended up digging through my small little paper packs to see if anything jumped out at me and my DCWV - The Natural Matstack did, so a Mojo Monday card was born. 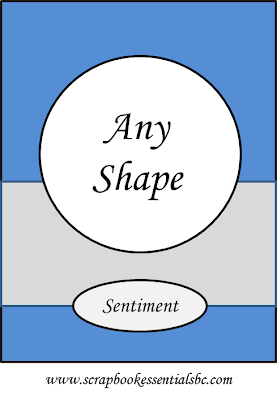 I decided I was going to switch the circles around so that my sentiment was not covered and I made the smaller circle into a button. I added texture here and there and stayed with clean layers. Supplies: Natural Ivory and brown cardstock, Designer Paper- DCWV, TPC-Cardmaking Happy Birthday, misc punches, Cuttlebug embossing folder, fuzzy twine, Pebble Inc- Candy Dots. 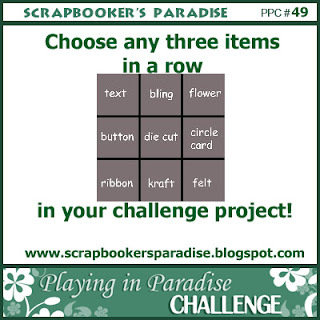 Happy Friday, it is time for this week’s new Playing in Paradise Challenge. 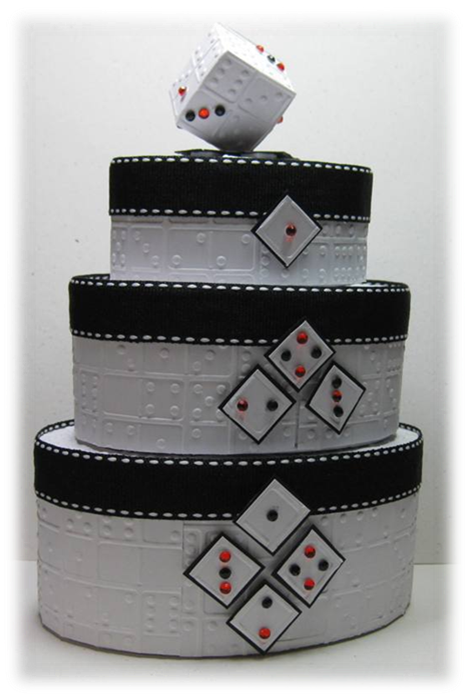 Please stop by The Playing in Paradise blog to see all the fabulous cards from the Design Team. 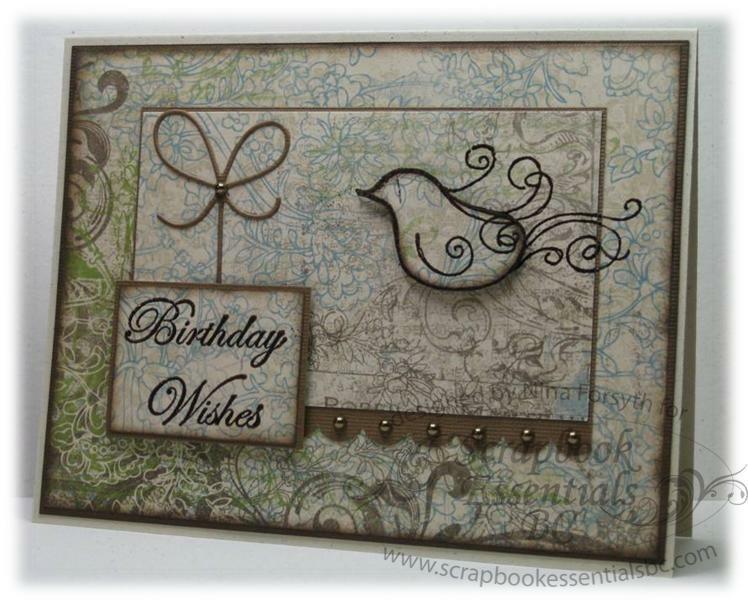 Supplies: Natural While and gray cardstock, Designer Paper-DCWV, Inspired by Stamping-All Year Wishes II, misc embossing folder, button and ribbon. Yes I know it is almost mid Jan and not July 1st, I also don't sit in my craft room singing our National Anthem although if you do bravo :). My co-worker is taking his Canadian Citizenship test today, I know he will do just fine. I think I have reviewed more elementary school history the last couple of weeks to make me wonder how on earth I every made it through to graduation. I know the results won't be in for about a month but I figured I would plan a head and give this to him and maybe some Red Velvet cupcakes when he has completed his Citizenship ceremony. I think Red Velvet would be as close to red and white as I will find this time of year. I am not up for baking fancy cupcakes. 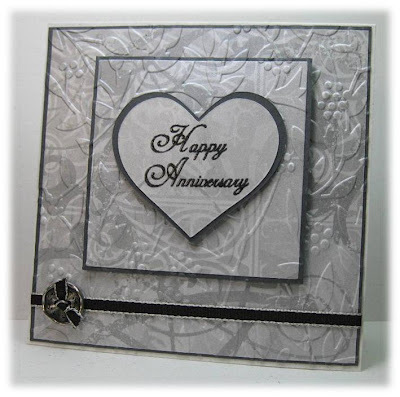 Supplies: Natural white and white cardstock, Designer Paper-Best Creations Inc, HOTP-Mix your messages. The card was relatively simple to create, for the bottom layer and maple leaf I used this fabulous red glitter paper. 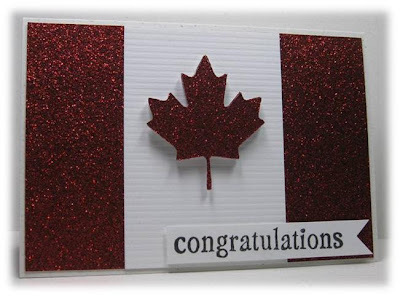 The center piece textured cardstock, and I cut the Maple Leaf with my SCAL and Cricut. Happy Wednesday, I love that it is mid week. The early week blues are behind us and the fun slide to the weekend begins. 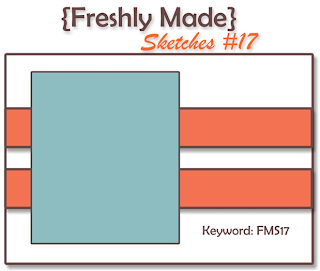 It is time for a new Freshly Made Sketches Challenge. I had fun making my card with this sketch. I wanted a softer looking card this week, I have had this pretty paper for a long time but passed it by time and time again but I was determined this week. I have the panel and sentiment popped up with foam tape, then finished with some pearls. 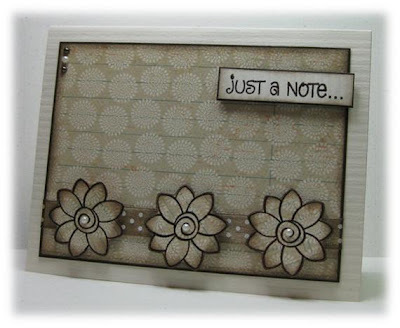 Supplies:﻿ Natural White and brown cardstock, Designer Paper-Daisy Bucket Designs, TPC-Cardmaking Hello, Sizzlits Little Leaves, Kaisercraft pearls. Please drop by the Freshly Made Sketches blog to take a look at fantastic sample cards that the Design Team members have created. 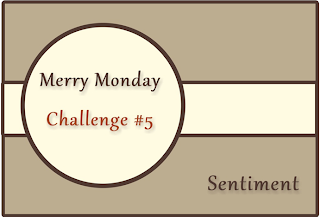 I am looking forward to all the wonderful creations to be submitted for this challenge. Good Morning all, 2012 is skipping along a good clip already. A quick personal note before we get to all that carding goodness. 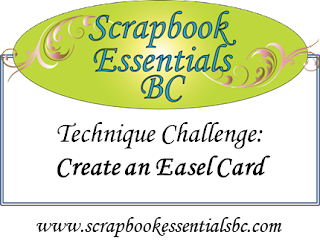 It is time for the 2nd challenge of the year with Scrapbook Essentials BC. 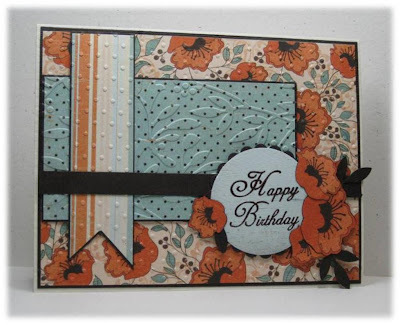 This week's challenge is an Easel card, I love this style of card but boy do I struggle to get a good picture. 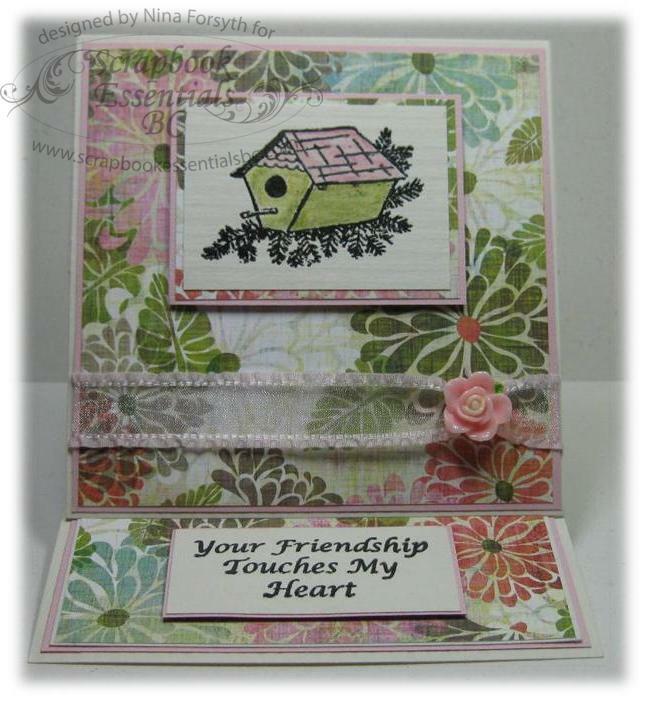 I used basic layers for this card, the bird house and the sentiment were heat embossed and popped up with foam tape. I added a beautiful pink ribbon and resin rose to finish, both of these products along with this stamp set can be purchased in the Scrapbook Essentials BC online store. 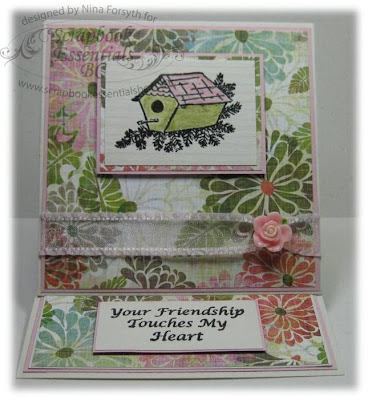 Supplies: Cream and pink cardstock, Designer Paper-Basic Grey, Essential Stamps-Birdhouse Background 1, Essential Charms and ribbon-Scrapbook Essentials BC.